Prototypic agonist for AMPA receptors. Also available in simple stock solutions (ab146679) - add 1 ml of water to get an exact, ready-to-use concentration. Our Abpromise guarantee covers the use of ab120130 in the following tested applications. ab96379 staining MEK1 (phospho S298) in SK-N-SH cells treated with (R,S)-AMPA (ab120130), by ICC/IF. Increase in MEK1 (phospho S298) expression correlates with increased concentration of(R,S)-AMPA, as described in literature. The cells were incubated at 37°C for 24h in media containing different concentrations of ab120130 ((R,S)-AMPA) in DMSO, fixed with 4% formaldehyde for 10 minutes at room temperature and blocked with PBS containing 10% goat serum, 0.3 M glycine, 1% BSA and 0.1% tween for 2h at room temperature. Staining of the treated cells with ab96379 (1/100 dilution) was performed overnight at 4°C in PBS containing 1% BSA and 0.1% tween. 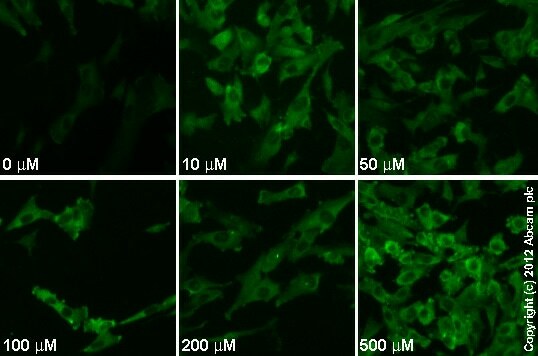 A DyLight 488 goat anti-rabbit polyclonal antibody (ab96899) at 1/250 dilution was used as the secondary antibody. There are currently no Customer reviews or Questions for ab120130.